As we talked last time, we are going to work on a short Persian story today. You may take a look at the lesson 140 first if you do not know what we are talking about. What we are going to do today is to go through the first part of this story. I will help you with the English translation of this lesson first. 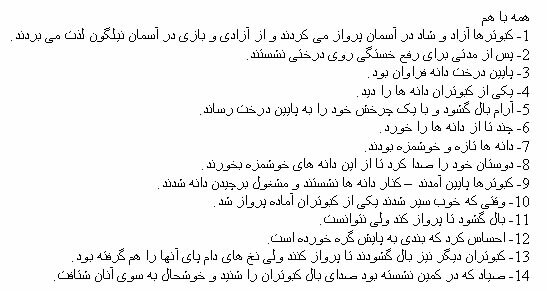 This is just to help you understand the structure of sentences in Persian. So, please don’t feel bad if the translation is not in fluent English. This is done on purpose to present a more loyal piece of work, loyal to the original Persian text. Ok, I hope you are ready. I deeply hope you had the time to work on the above text as I had asked you. If not, give it a try now before reading the translation presented below. Pigeons, free and happy, were flying in the sky and were enjoying the freedom and games in the blue sky. After some time, to get rest, they sat in a tree. Under the tree, there were plenty of seeds. One of the pigeons saw the seeds. Gently, it opened its wings, and with a turn, landed (arrived – got there) under the tree. It ate a few seeds. The seeds were fresh and delicious. It called its friends so that they could have these tasty seeds. The pigeons came down, sat near the seeds, and started eating the seeds. When they felt full, one of them got ready to fly. It opened its wings to fly, but couldn’t. It (the pigeon) felt a rope / string was knotted to its legs. Other pigeons opened their wings as well to fly, but the ropes of the net was knotted to their legs, too. The hunter who was sitting in hide (who was hiding) heard the noise of the pigeons’ wings, and ran to them happily. Done? Well done! Now, go to the Useful Drills page. See you soon again (I hope so! ).